The Striker Stereo Control Pad is a third-party Sega Mega Drive controller released by Beeshu. It improves on the standard Mega Drive controller in many ways, having turbo buttons, an 8-foot lead, a mini joystick replacing the D-Pad and a stereo headphone socket. In North America, retailer Radio Shack distributed a different branded version known as the Archer Competition Controller. The peripheral had to be discontinued after it was identified as a choking hazard. 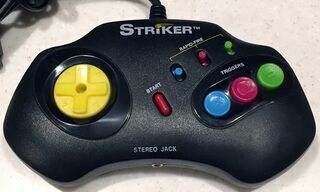 Main article: Striker Stereo Control Pad/Magazine articles.